Wide, open roads. A strong, hot coffee in hand. And, to round out perfection, your best friend snuggling against you. Sounds like a dream, right? Well, for more than forty percent of truckers, having their beloved pet on the road with them is a reality. 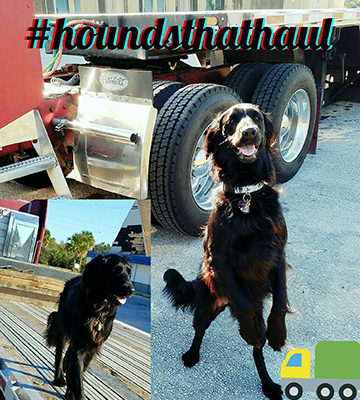 As you can tell by our moniker, HaulHound is a big proponent of trucking with pets. (You can see more about the origin of the HaulHound name here.) After all, isn’t everything just better when you have your best friend with you? We sure think so! It turns out we now have science to back us up on this. New studies show there are surprising health and productivity benefits that make trucking with pets a win-win for both drivers and trucking companies alike. Furry, scaly or feathery companions can induce a calmer state in their truckers, including lowered heart rate and blood pressure, which promote overall physical and mental health. Pets of all kinds can offer an extra layer of security, warning us of approaching bad guys while we sleep and averting attempted break-ins while we’re not in the truck. Because pets require more frequent breaks, they can help reduce driver fatigue and promote safer trucking. Luckily, the list of trucking companies that allow pets is growing longer every year. If you’re thinking about bringing a pet on the road, make sure your current or future trucking company has a compatible pet program. Most trucking companies with pet policies have restrictions based on weight (and oftentimes even breed), so make sure your pet meets the criteria before signing up. You’ll also want to verify that your kind of pet is allowed. While some pet friendly trucking companies allow any and all animals under a specified weight, others allow only dogs. If you have a feline companion or an “exotic” pet, you’ll want to be extra cautious of the policy language. 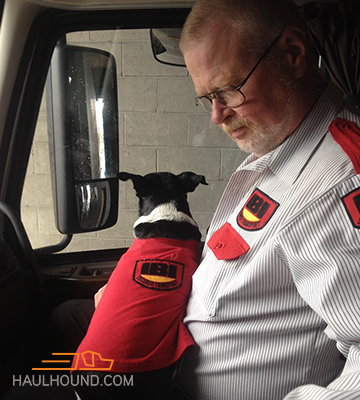 Be forewarned that even the most pet friendly trucking jobs require a damage deposit. The most common amount for a damage deposit is $500, but some companies go as low as $200 or as high as $1650. This is often taken from your paycheck over the course of several weeks or months. So if you’re looking to take Fido or Max along for the ride, here are just a few examples of trucking companies with pet policies that show the range of potential rules and restrictions. Heyl Truck Lines: Dogs only, $500 damage deposit. Must be on leash on company and customer property. Covenant Transport: Maximum weight 50 lbs; can be spread across two pets (25 lbs each). $500 pet fee. West Side Transport: Up to two dogs with combined maximum weight of 40 lbs. $1750 damage deposit and monthly inspections. H.O. Wolding: One pet policy; can be cat or dog. $500 damage deposit for pets under 35 lbs; $1000 deposit for pets over 35 lbs. Cats must be declawed. H & M Trucking: Up to two pets of any kind, so long as they are not “aggressive.” $250 deposit can be paid across 10 weeks. Hogan Transport: Dogs only. $200 deposit fee. No “Aggressive” breeds. J.B. Hunt: Dogs up to 60 lbs; no “aggressive” breeds. $300 deposit.